Doing an illustration for my other blog, I had a very frustrating experience with new quality drawing paper which got me thinking and indeed resulted in a flood of ideas, what can be done with the 99 sheets of paper that are still left from the block. So I decided to install a whole new blog to show you the results. I hope you will enjoy them as much as I like to create the projects. The sheets of paper I am working with are size A4 (21 x 29.7 mm), 185 g/m². Here comes my first project: pyramids. I remember them from my childhood, when we drank Sunkist juice with straws out of them. Also in Britain you can buy PG Tips tea in such cute tea bags. I was always wondering, how one could do these intricate containers. When I discovered how simple they are to create, I was all the more fascinated with them. Cut a rectangle with one side twice as long as the other. Then fold in half and glue or sew them together (as in the above project) along the adjoining sides. Leave open the last side. Open and fold exactly in the opposite way so that the seam meets the middle of the leftover side. Then glue or sew together. Pull a bit until it shapes like a pyramid. 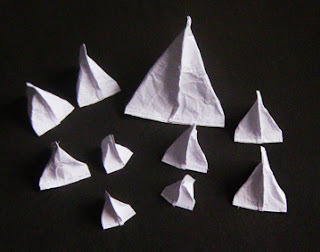 While doing them I discovered that it is much easier to fold the creases and properly shape the pyramids, if you thoroughly rumple the paper and smoothe it out before sewing it. The paper is much easier to handle then. Of course you must not overdo this or it might tear.